I put in your date range, Philippe, for vol. 2 of Science des Signes, with a brief explanation of why those dates (see "c. 1806" entry). It is a worthy rebuttal to DDD; I hope it was OK to cite you. I also made a few changes suggested by Kwaw to"1788e", "c.1789 or later", and "c. 1820". Nice, Philippe. 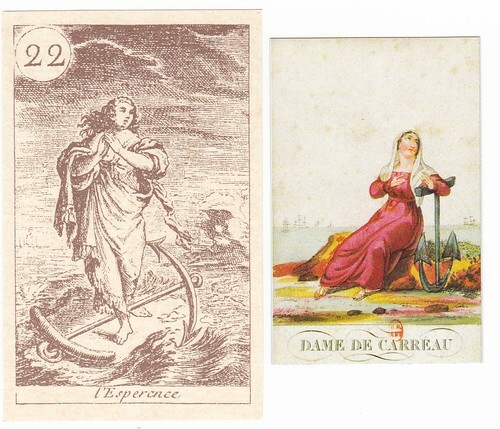 Do you have titles (other than "Grand Oracle des Dames"), dates, publishers, or addresses for these two? And can you say something about their LWB's, even post their pages, or a sample. like first and last pages of the various sections. To me the LWB's are as much of interest as the cards themselves. The first, which he calls 'Oracle des dames' by Etteilla, he dates to 1797. It is in German, so perhaps Huck can relate the content for us (better than google!). Accordingly Tarot is an ancient Egyptian Book of Wisdom and the cards were brought by the gypsies in Europe. Etteilla took these theses and published the first rules of interpretation of Tarot cards. 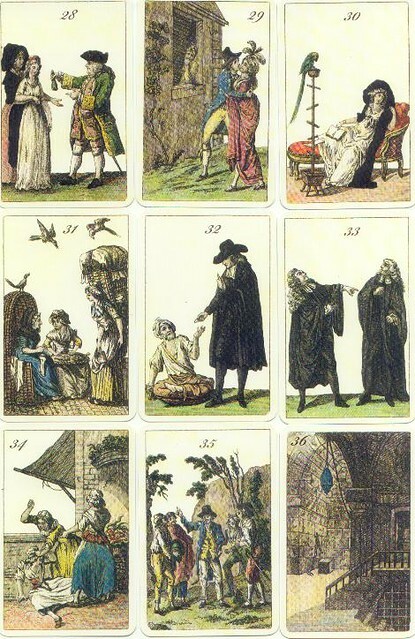 In 1789 he issued his own cards, which became known as the "Grand Etteilla". "The Egyptians, our masters in the arts that we have neither invented nor perfected, created a game where create any arrangement of cards that are shuffled by random hands, an ensemble that in the key events and the incredible opportunities gives life to this magical art, now within reach for the world, provides a food for special;. it provides an amazing level of mystery to most things that in the fog of mystery, betrayal, the thefts, the Sorglosigkeiten who Love filter. The magical chains of these powerful feelings that dominate all sensitive souls, here reveals a mystical language to the ancient Egyptians had the key. " "One day the truth of probability is given birth." - This phrase of the poet Saadi shows the first page of the supplement to the deck from the year 1797. Love is represented as a sliding above the Earth beings. A transparent band covers her eyes, the left hand grasps a flower garland. The bow, which she holds indicates that it is ready to pierce the heart of a man who mistrusts her. As with all maps, it is important to decide what card it precedes or follows. Lucina, "the to light Promotional" is the goddess of childbirth and of the Moon. She opens her newborn's eyes and gives them the vision and inner enlightenment. As a map it symbolizes the "look through" of an event, the creative success of a project or even the birth of a child. This divination card deck is the reproduction of an ancient decks of cards, which has been issued by Realis Verlag together with a Tarot Calendar for 2007 in a limited edition. Meanwhile, these cards are not available any more. They are designed by the famous French soothsayer Etteilla himself and his late 18th century appeared the first time. The style of presentation and the clothes of the people on the maps do not contradict. Accordingly, they may well be Etteillas lifetime (1738 - 1791) have arisen. More likely, however, it is that these cards were created after Etteillas death and designed on the basis of the so-called Petit Etteilla. 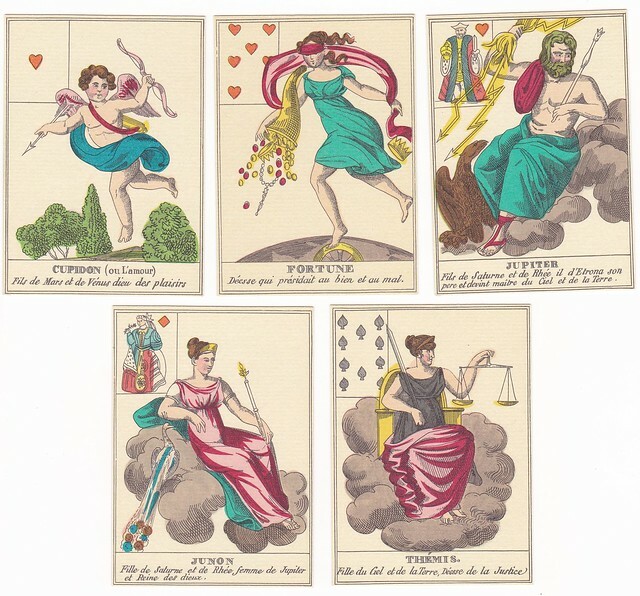 Such cards were quite popular in the 19th century and were sold under the French name "Oracle des Dames". However, the custom of Etteilla Tarot cards were sometimes referred to as "Etteillakarten" or "Oracle des Dames". Already at Etteillas lifetime is "Etteillakarten" has become a general term for Wahrsagekarten. 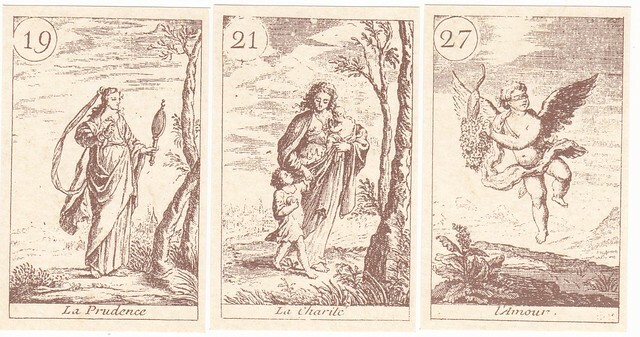 Today we distinguish between the Petit Etteilla (small Etteilla), which Etteillas special divination deck is meant and his Tarot, the Grand Etteilla while "Oracle des Dames" and Etteillakarten be used as a general term for Wahrsagekarten of the 19th century, based on the interpretations Etteillas rest. It is therefore not ruled out that the presented here cover easily this time popular name was used. The deck consists of 36 cards that are numbered, but which do not map title. 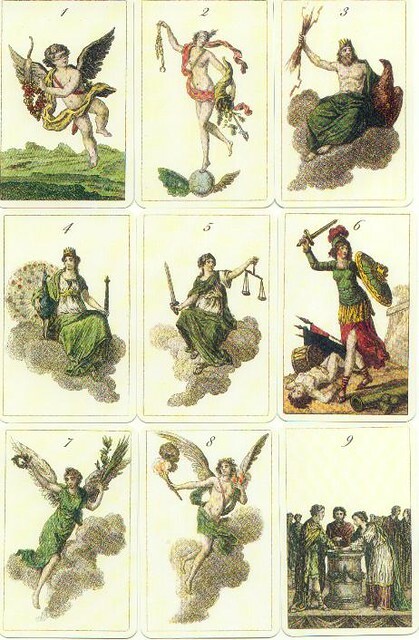 The card images symbolic scenes and individuals and deities from Greek or Roman mythology. I presume the poet that is quoted is the Persian poet and mystic Saadi of Shiraz, a French translation of his Gulistan was made in 1634 by Andre du Ryer, and his Bustan and the Gulistan into German in 1654 by Adam Olearius. The original was in a private collection dispersed 22 years ago. I don't know who owns it now. It sounds, as if somebody had such a deck, and made a reproduction (2007, Realis-Verlag). It was sold together with a Tarot-calendar 2007. It's not available (sold out). Somewhere the year 1797 must have been mentioned on the cartonage or in the booklet (together with a "Chez l'Auteur"; which sounds, as if this was from Sauveur). The web page author speaks in a manner, as if the old "Begleitheft" (booklet) at least in parts was used in the modern edition. The motifs are not in all cases the same as in that, what is called the Finet deck. Perhaps we should compare the decks first. The numbers are exchanged, at least mostly. I found a theatre play, which used a card divination deck called "Oracle des Dames" (NOT Petit oracles des Dames". Somewhere the year 1797 must have been mentioned on the cartonage or in the booklet (together with a "Chez l'Auteur"; which sounds, as if this was from Sauveur). 1. Petit (le) Oracle des Dames. Batilliot jeune. 2. Oracle des Dames. Gueffier. 3. Oracle (l') parfait. Blanchon. I have added this "Oracle des Dames" without the "Petit" to the timeline as "1797b", giving a link to post 12 here and after. We still have no date for the mythological deck. ... and on my wishes the author presented the article of 2007 (Tarot-Kalendar). At one of the pages the impression of the earlier accompanying text (1797) is presented. The publication address is again "Rue Nicaise Nr. 513" (as in the text, which was recently presented by Depaulis for the earliest note to the Petit Oracle des Dames). 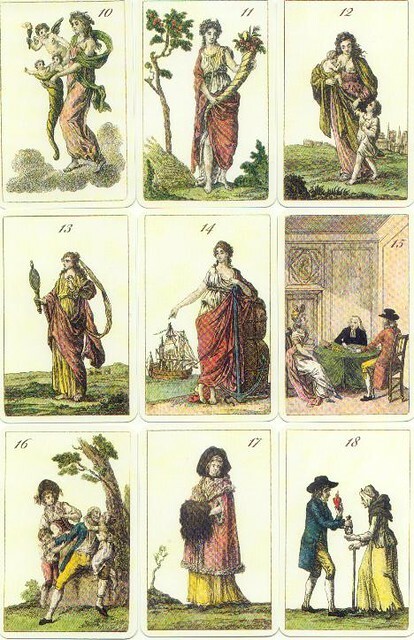 Depaulis quoting the earlier text: "Petit oracle des dames / Petit Etteilla, jeu de 42 cartes, avec livret Tableaux mobiles des jeux de fortune, ou l'Art de lire dans l'avenir avec sûreté par le rapprochement des événemens qui démontrent sans réplique l'art chronomancique. A Paris, [b]Chez l'Auteur, rue Nicaise Nr. 513. An cinquième / 1797. " 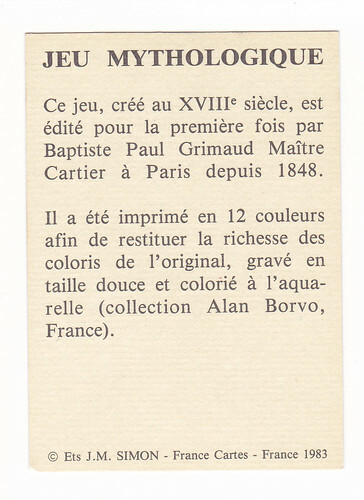 That's definitive the same publication address for a version with 36 cards, and so one can conclude on the same producer, Jacques Grasset de Saint-Sauveur. 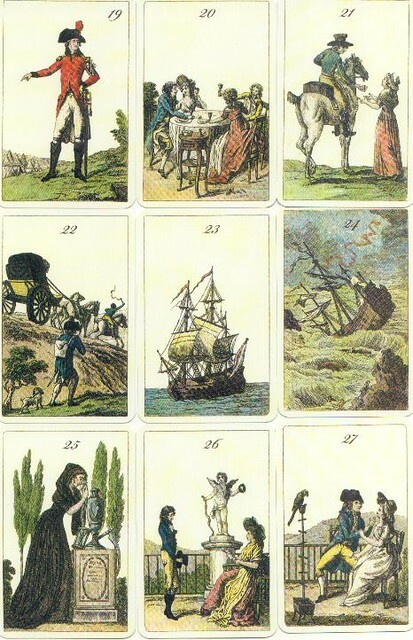 The text part "Tableaux mobiles des jeux de fortune, ou l'Art de lire dans l'avenir avec sûreté par le rapprochement des événemens qui démontrent sans réplique l'art chronomancique" is repeated in both versions. ... then used for the production "Le petit Horoscope des Dames".